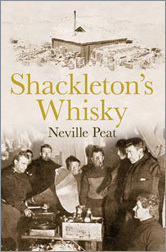 Sir Ernest Shackleton could never have imagined his name being closely associated with whisky, certainly not in the title of a book. Rarely did he consume strong drink. On his expeditions, he tolerated a 'mild spree' at times of celebration. But that was all. Drinking to excess appalled him. From an early age, growing up in a teetotal home, he was wary of alcohol. How, then, must he have felt about signing an order for twenty-five cases of whisky - 300 bottles - for his 1907-09 British Antarctic Expedition? Shackleton's Whisky follows the story of the Rare Old Highland Whisky taken south on his Nimrod expedition. It celebrates the extraordinary achievements of men exploring an extraordinary place. It dips into the human-interest stories of polar life in the 'heroic era' of Antarctic exploration. Shackleton once wrote of his interest in documenting 'the little incidents that go to make up the sum of the day's work, the humour and the weariness, the inside view of men on an expedition'. Here is one such account, based largely on what he wrote and said about the expedition and also on what the members of his expedition wrote, for most participants kept a diary or journal. Antarctic exploration and whisky, in their own way, are both steeped in history, maturity, endurance, character, and technology. Both have a worldwide following, millions of fans. Their pathways coincided on the British Antarctic Expedition 1907-09. With the recovery 100 years later of three cases of Scotch from icy entombment under the hut at Cape Royds and the subsequent return of three bottles to Scotland for sampling, analysis and a near-magical replication, the relationship of whisky and Antarctic exploration came sharply into focus, making a unique odyssey to the end of the Earth and back.